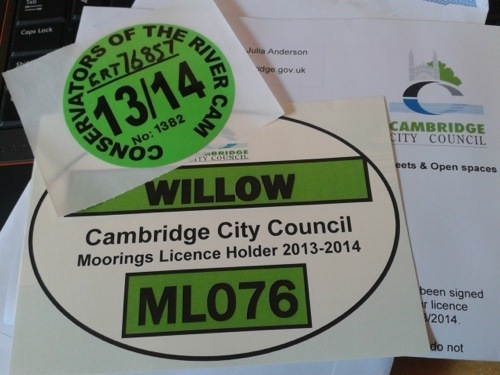 Finally, our long awaited river and mooring license discs have arrived. On the same day, and in the same garish green colour. 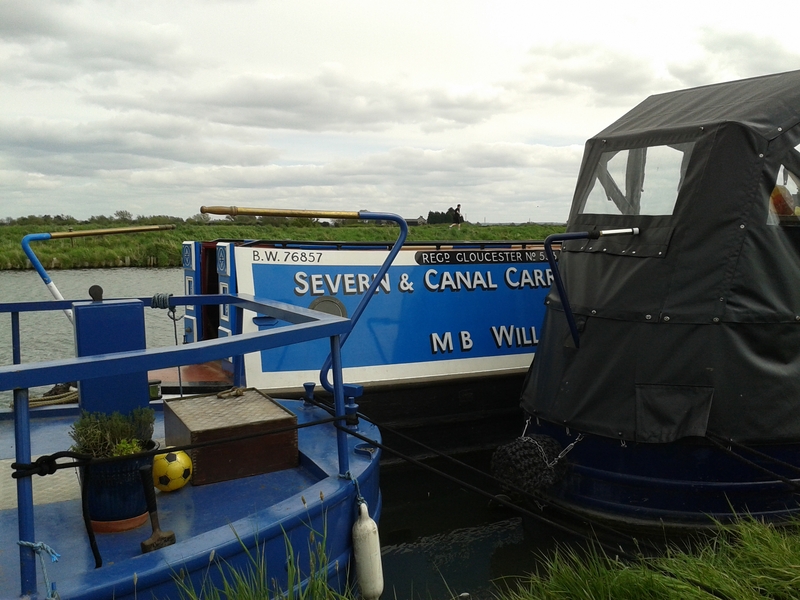 So Willow’s now officially registered on the Cam. 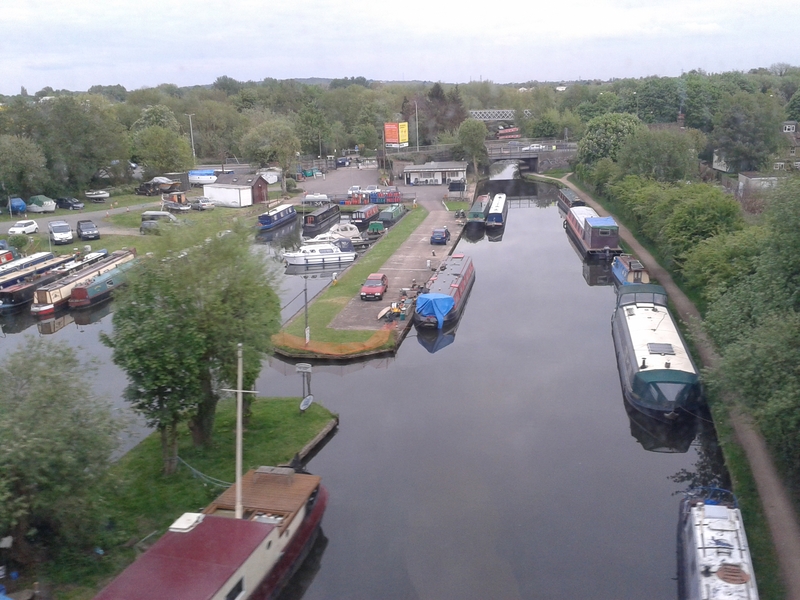 I had a letter through from the Canals and Rivers Trust reminding me to licence it, and I hope that they’ve got the message that the boat has left their water. Interestingly (to me anyway) we don’t have an EA registration number, as although we are free to use EA water as part of having a Cam license, we aren’t registered with them. And the Cam Con doesn’t bother giving out new numbers if the boat already has one from somewhere else. So our Cam Con disc uses Willow’s original C&RT number, 76857, which it has had since BW first issued numbers in the 80s (?). Today, we took the Duck on one last cruise, out to Hartford Marina, where it is now on brokerage. It was dreadful weather- cold, drizzly and with the recent rain, the river was on the rise. 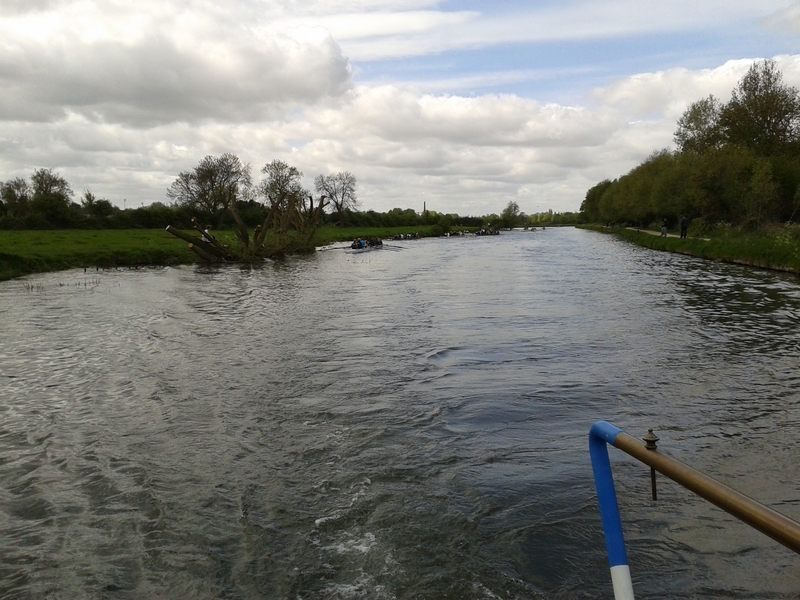 But it was nice to be boating for one last time on the Duck, and apart from the Old West which is tiresome, it is a pretty route. 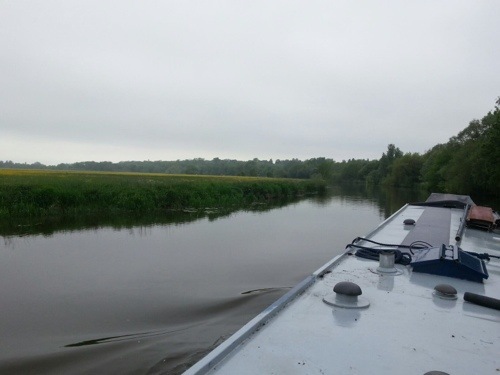 The plan had been to take it part way, but with Strong Stream Advice on the horizon although not yet issued, James took it all the way to the marina near Huntingdon, which has floating pontoons for safety, while I hopped off at St Ives to go back into town for rowing. 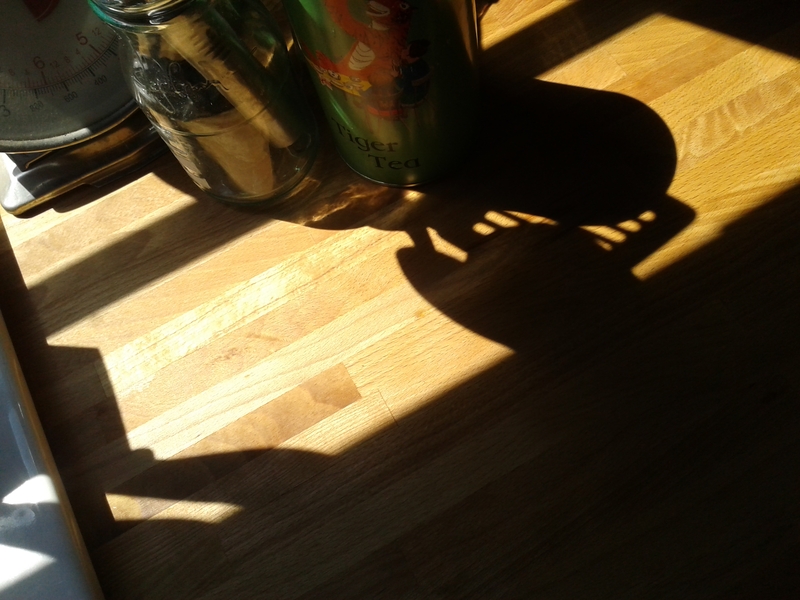 What a gloriously sunny bank holiday weekend! 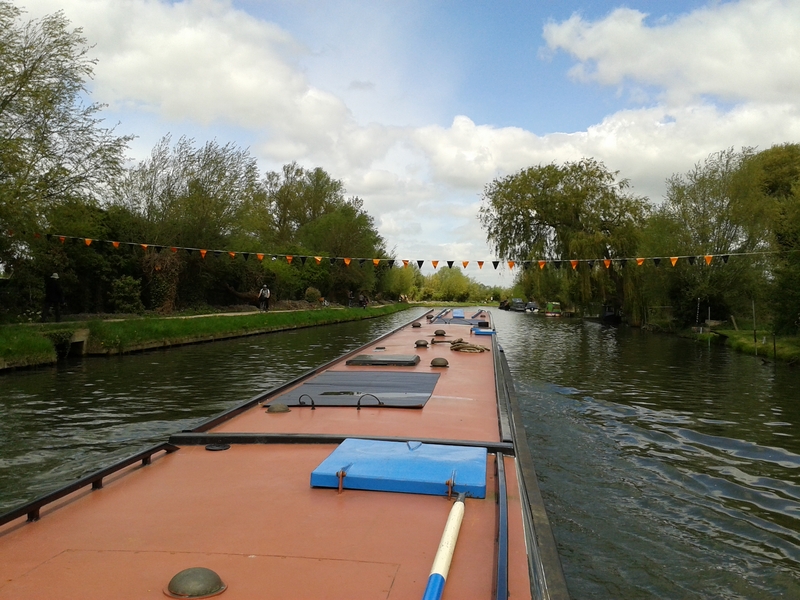 Saturday we went out to Waterbeach to move the Duck, and ended up visiting John Pippin, and going to the charity shop at Emmaus. We got a pretty good haul – some Willow pattern plates, some brass push plates, a spice rack and a little chest of drawers. I will post about them separately when I have some photographs. I’ve also picked out a lovely old bike from John’s vast collection of old bikes, which he is going to do up for me, as mine was nicked the other day. I’m very excited about it! By the evening however, James wasn’t feeling too well. Unfortunately he continued to feel unwell throughout Sunday, and I didn’t feel great either, so we both just lolled about at home, wishing we could either be out in the sun or getting on with work on Willow. Thankfully having a bigger boat meant that even with both of us ill and at home, we had space. We were also very thankful for friends who came around with a care package, so we didn’t need to drag ourselves to the shops. On Monday we were both feeling a bit better so we were able to get on with some jobs. 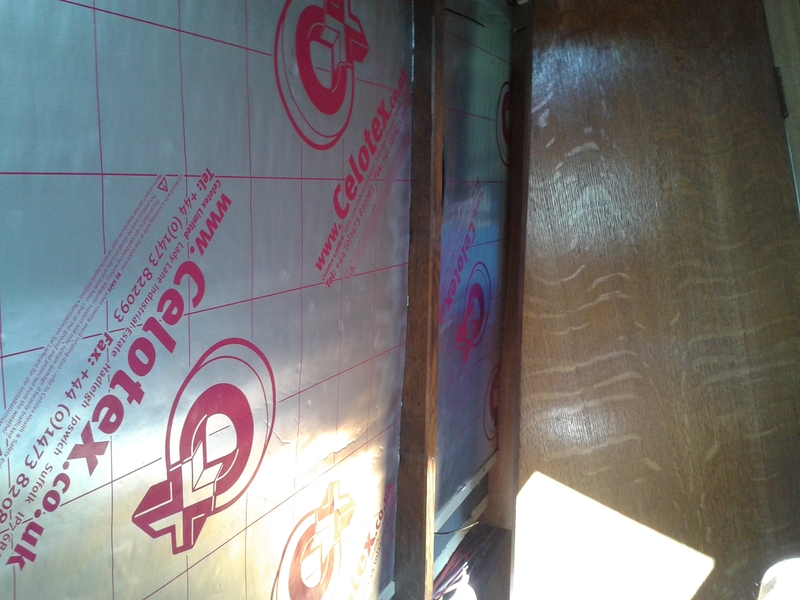 James battened out and insulated the bathroom with Celotex and I sanded and oiled the kitchen worksurfaces. 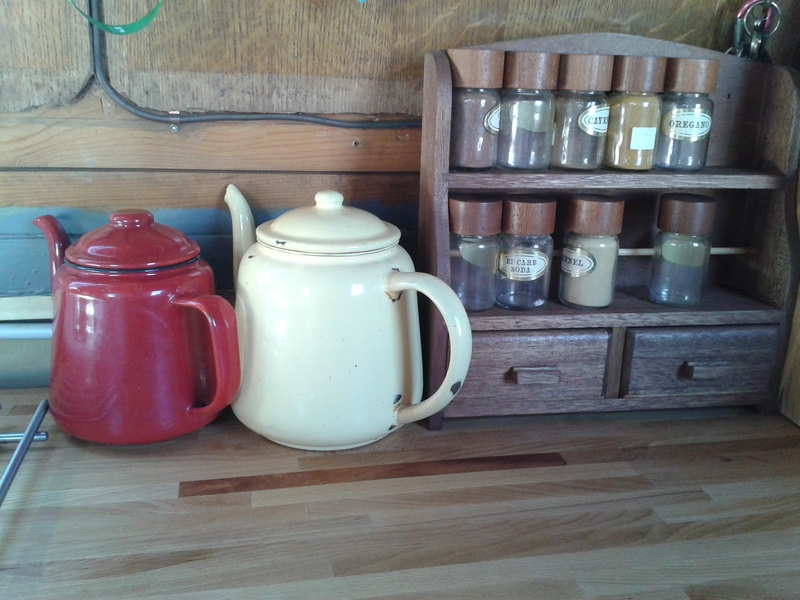 After we’d been to Emmaus on Saturday, John had sanded, cleaned and oiled the spice rack for us, and it looked so good that I resolved to come home and sort out my kitchen. I sanded the surfaces down first, and the few little splashes which had left marks were easily removed. Then, following John’s advice, I cleaned all the surfaces with vinegar to remove the dust. Next I applied two coats of the oil which IKEA suggest for their worksurfaces. I also treated my big chopping board in the same way. The IKEA oil is certified for use on surfaces where food will be prepared. It’s all looking very nice. Despite being sidetracked by putting the Duck back on the market, we’ve still managed to get a bit done on Willow. I’ve given up calling them ‘Days’, because we fit in a bit here, a bit there and so it goes. We are now sleeping in our actual bedroom. Not got any decent photos of it so I will put some up when I have them. We hung a clothes rail and put the chest of drawers under the bed, but we still need more storage. We also want to make the bed into a cross bed at some point, to give us more space around the bed. The other thing we have planned for the bedroom is a lovely map for the bulkhead wall. 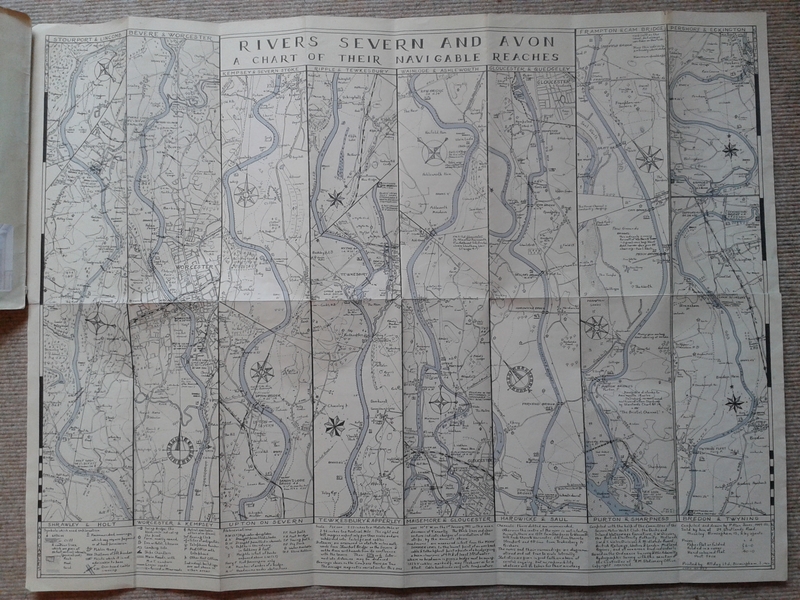 If you remember, I said I wanted a map of the Severn… well, eBay came up trumps. This map was drawn by hand in 1950, and shows the Severn, the Gloucester and Sharpness and the Avon. It is quite beautiful. We plan to copy it rather than put up the original. 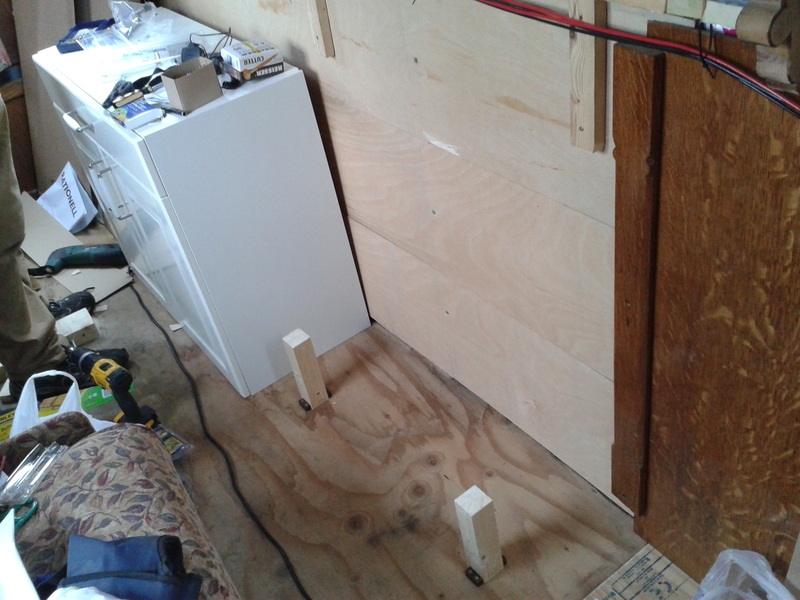 The other thing we’ve done is install our ‘sideboard’ cupboards in the living room. 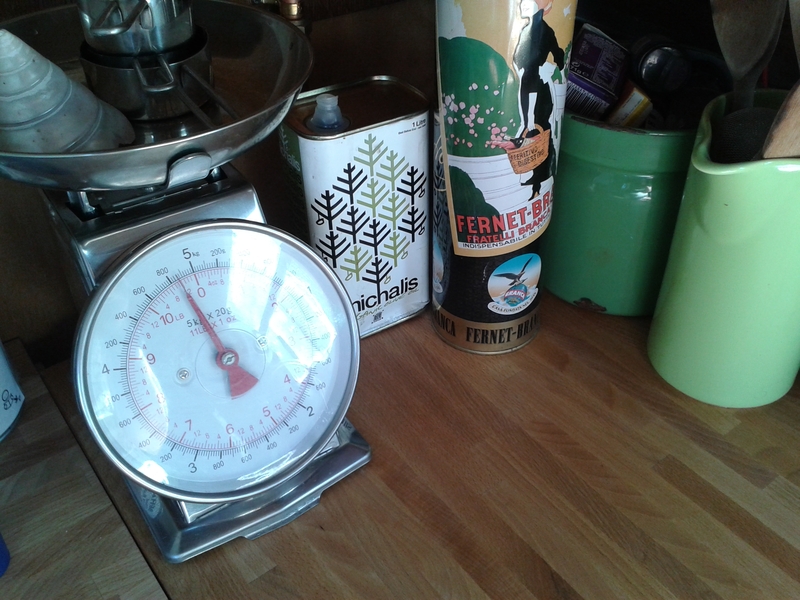 We felt that we needed more storage for bits and bobs that don’t have a home in the kitchen or bathroom. 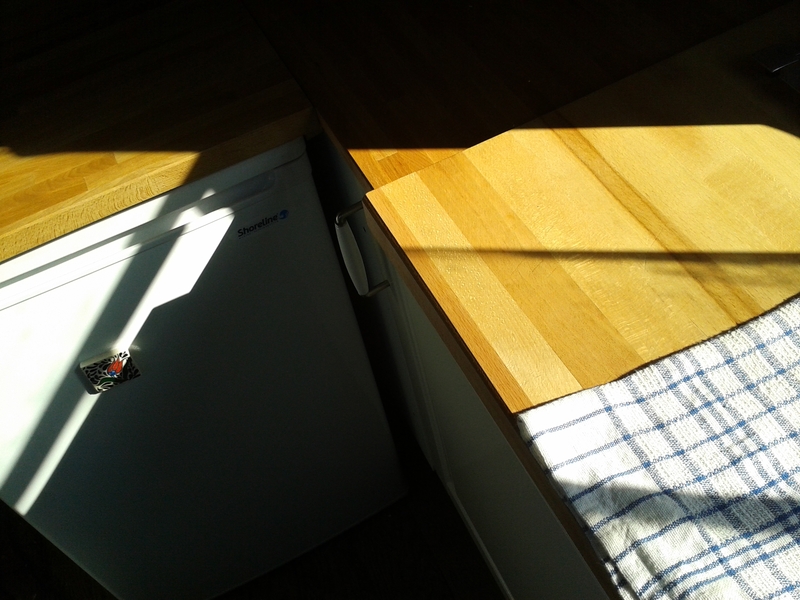 There will be a worktop on top, the same as the ones on the kitchen, made of beech wood. 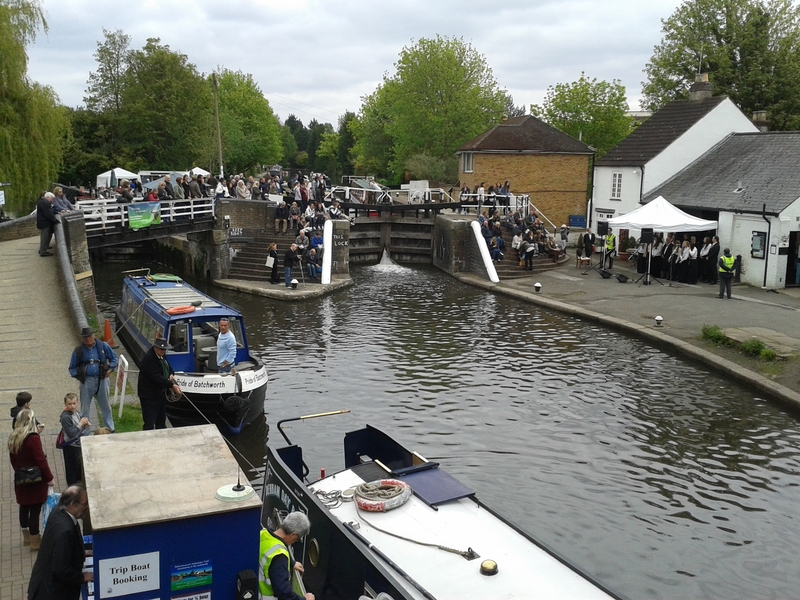 After Thursday’s bad news, we resolved to have a Day Out on Saturday, and headed down to the Rickmansworth Canal Festival on the Grand Union Canal. 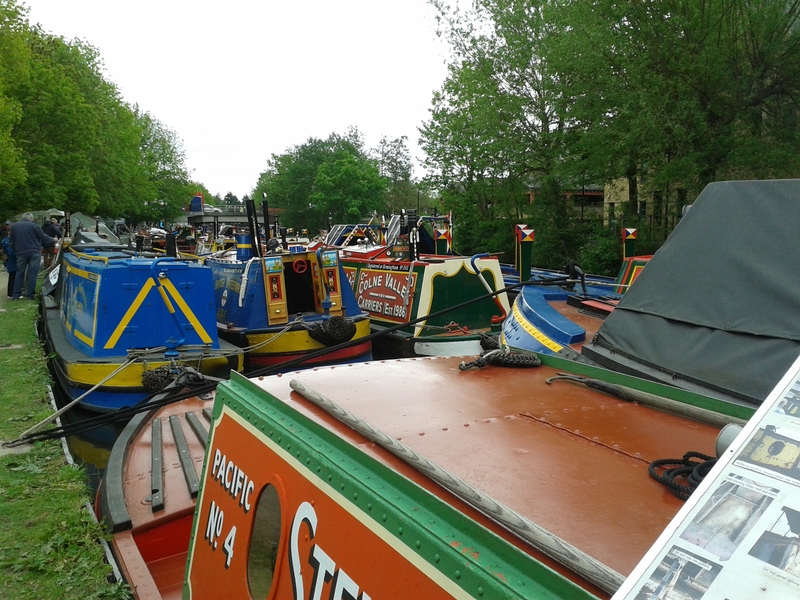 It was a lovely day, and we had fun seeing boaty friends, looking at engines and whether they might fit in Willow, wandering around the stalls, and of course enjoying seeing all the historic boats. Most fun was the tug of war! We sat on the opposite bank with Simon and Carrie (of Tortoise and Blackbird), watching the fun and drinking cheap cider. 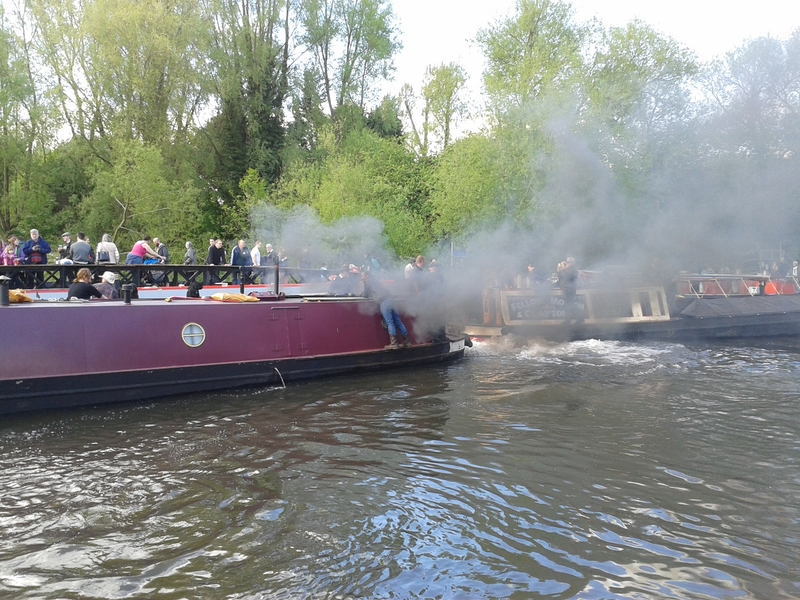 At one point we were called upon to provide ballast for tug Hayley so got to participate as well. 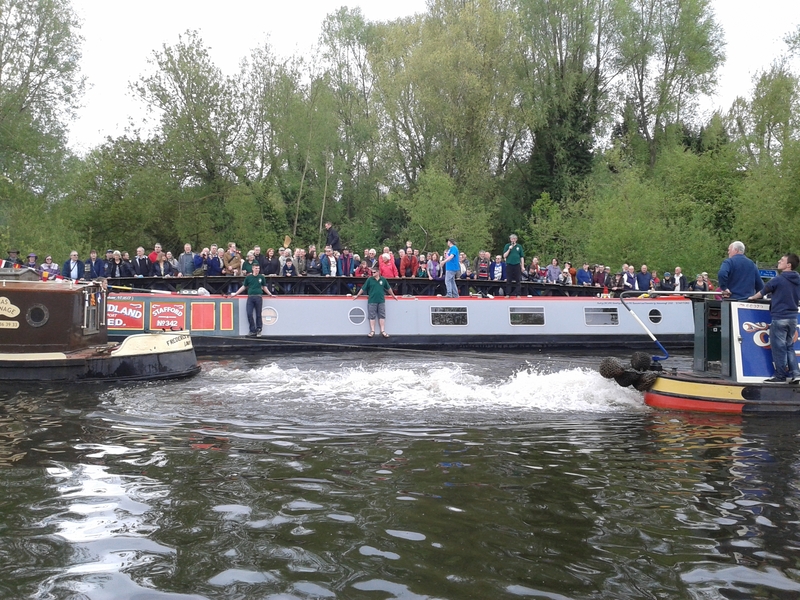 The commentary was provided over the loudspeaker by our friend Chris and his mate Adrian, of the Rickmansworth Waterways Trust. They kept up such a stream of boaty banter that we stayed and watched the various rounds of competition all afternoon! 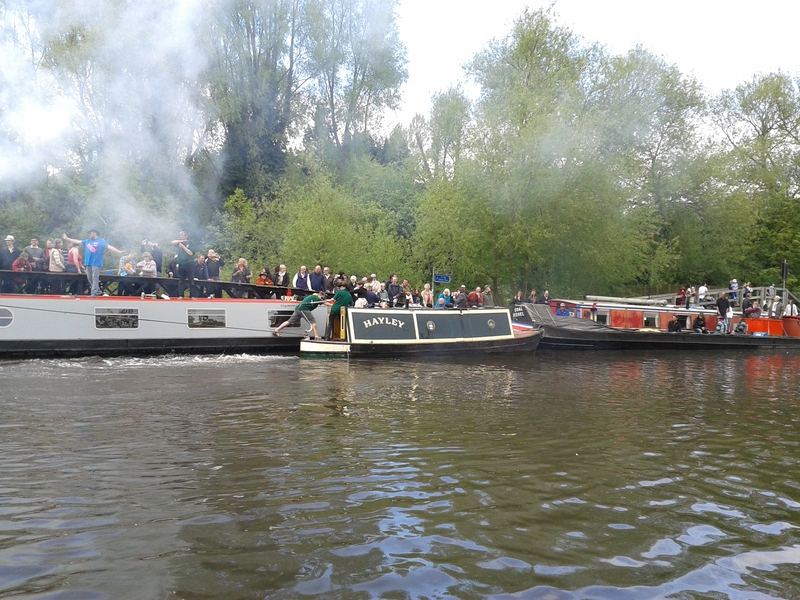 The winner was the beautiful tug Frederick Whittington (unsurprisingly as it has a Gardner 6LW!). James’s brother Sam lives in nearby Watford (in fact he works in Ricky) and so we had a cuppa with him before heading home. All in all a good day and just what we needed! Details of the boat are here. 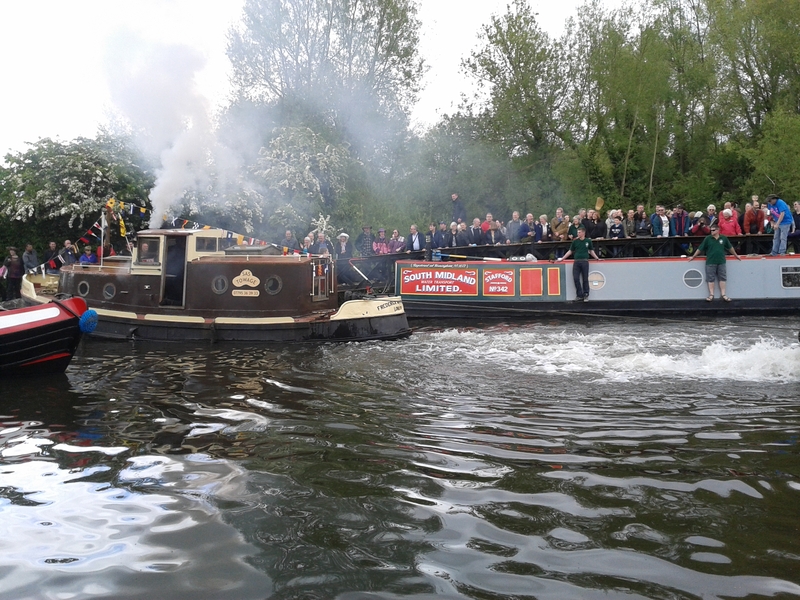 Lucky Duck is a 48ft traditional stern narrowboat first registered in 1986, with a reliable BMC 1.8 engine. 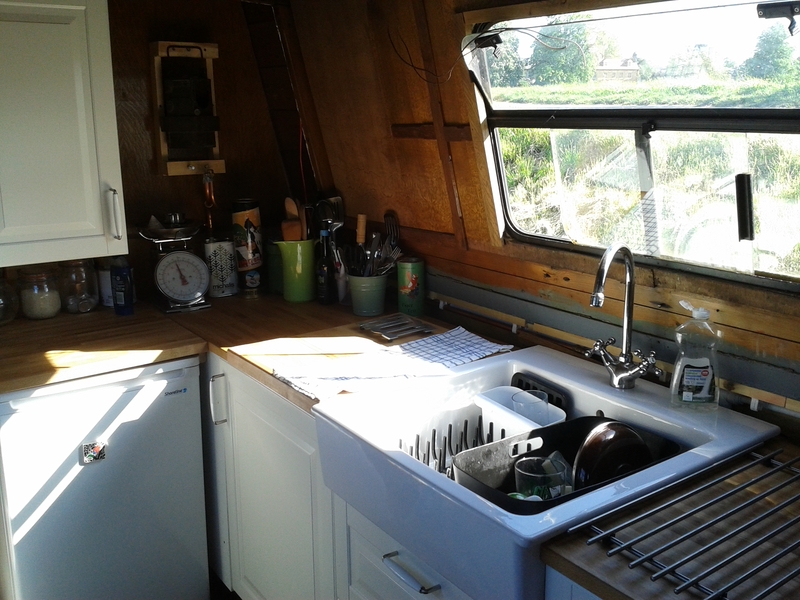 It sleeps 2, makes a great live-aboard boat and is well adapted to coping with being away from shore power. 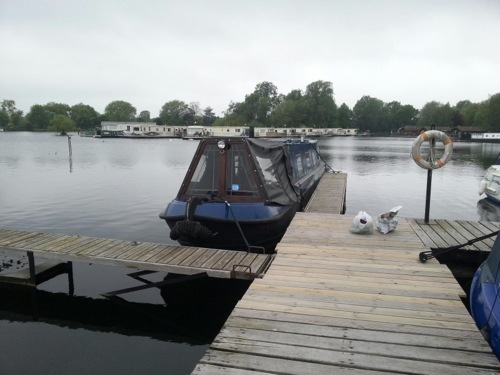 Easy to handle and well laid out inside with a traditional ‘saloon forward’ layout, it would be a good starter boat for anyone looking to begin a life afloat, or enjoy some holiday cruising. All systems are in good working order. Last backed August 2011, BSC until 2017. Hull survey carried out 2013 and available for viewing. 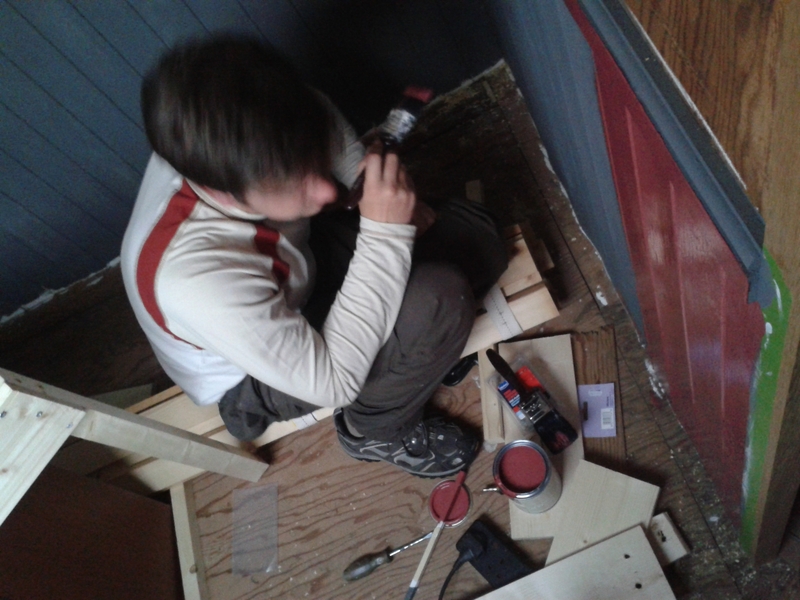 Over the last few evenings we’ve been beavering away painting the bedroom. And we’re nearly there. 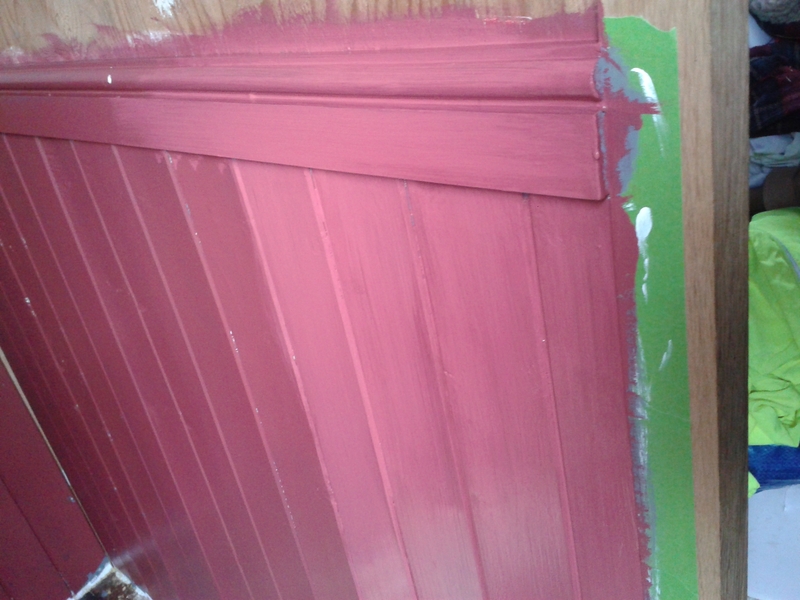 The Farrow and Ball paint was a good choice – the finish is lovely, and the colours gorgeous! 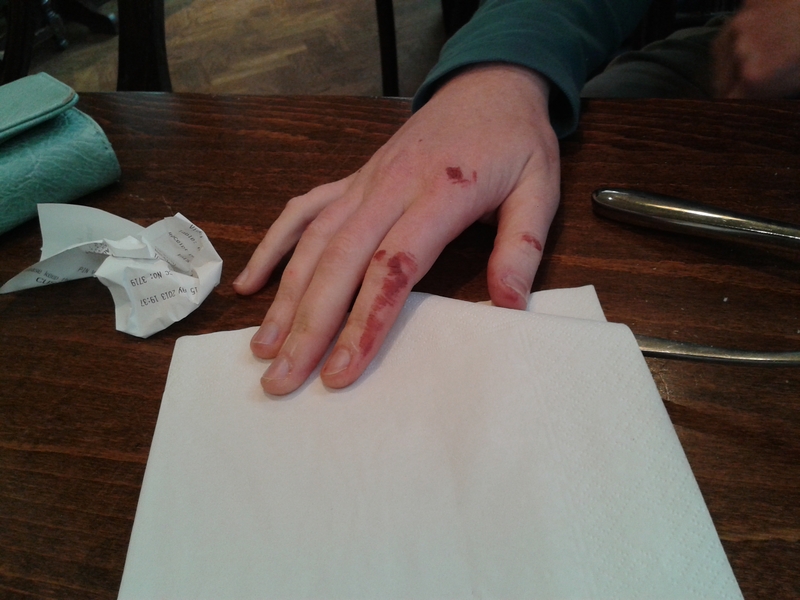 Although I did get asked if I’d done something awful to my hand – see picture 3 – because the dark red dried to a very blood-like shade on my skin! 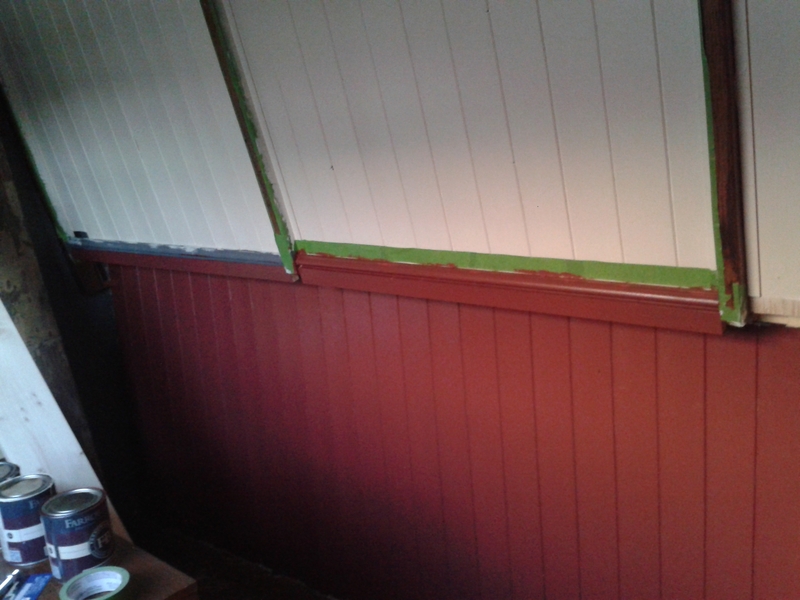 At first we were a little worried – the red colour goes on a sort of dusky pink which we were not too fond of -see picture 2 – but once dried and with two coats it is a gloriously rich dark red which complements the cream above very well. 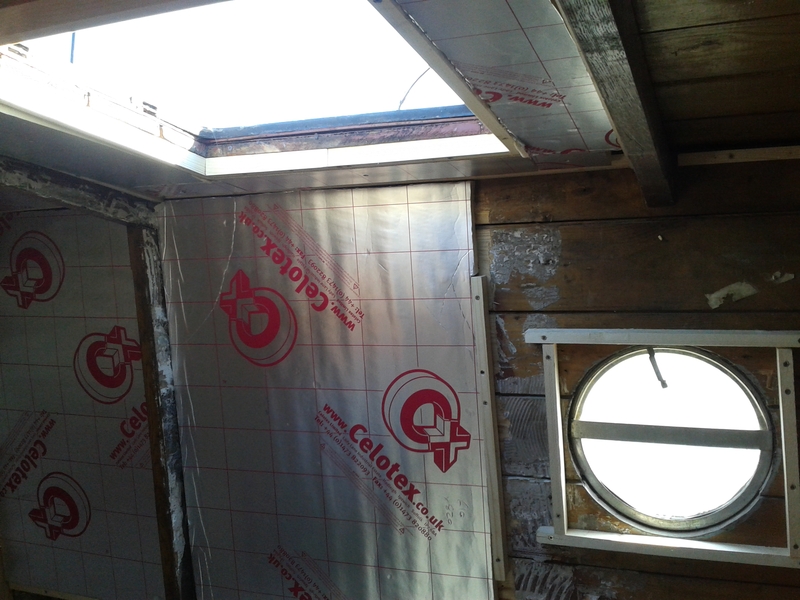 We’ve still not decided what to do with the top of the bulkhead above the paneling. I have some old nautical charts which my dad acquired when the University of Exeter’s Geography Department threw them out some years ago – one of the Thames, one of the River Exe where I grew up, and one fairly random one of Finland. They would work well as wallpaper. What I really want is a map of the Severn! But we might put up the Thames one for now. We’ve also wired in the lights and switches too, so we have doubled the number of lights in the boat! 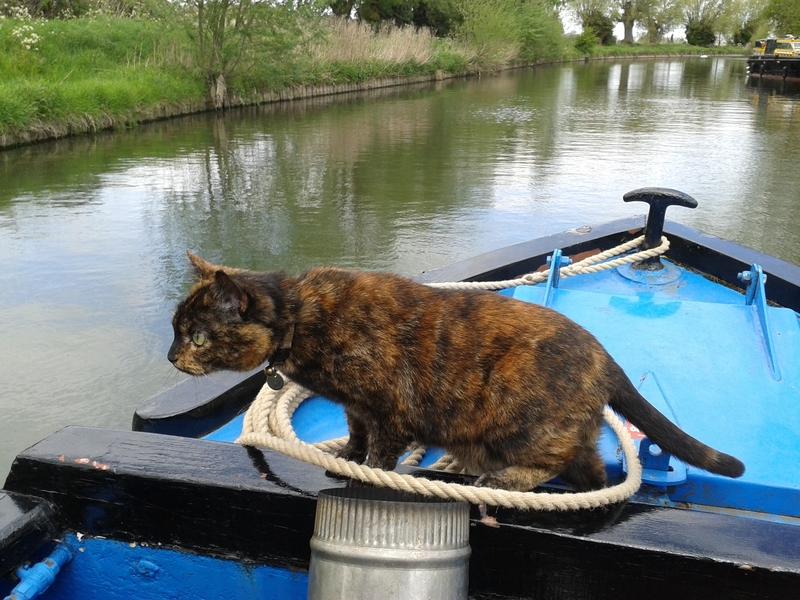 I keep a list of Old Boat Blogs, similar to Sarah‘s list (although some of my Old Boat blogs aren’t about narrow boats) eg Misterton, Wendy Ann 2 and Bonnie. Recently, our friend Dan started a blog for the restoration of his historic BCN day boat no. 1645, which Willow used to be moored next to. He hopes to restore it sustainably, using reclaimed material where possible, a worthy aim! 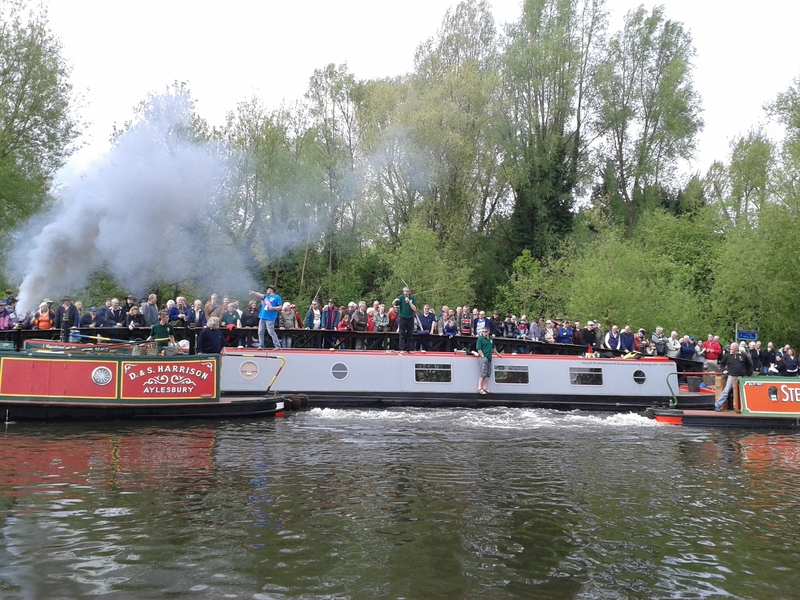 In related news, I’ve also just taken on the role of managing the New Media communications for the Historic Narrow Boat Club, which can now be found on Twitter (@HistoricNBClub) and Facebook ! 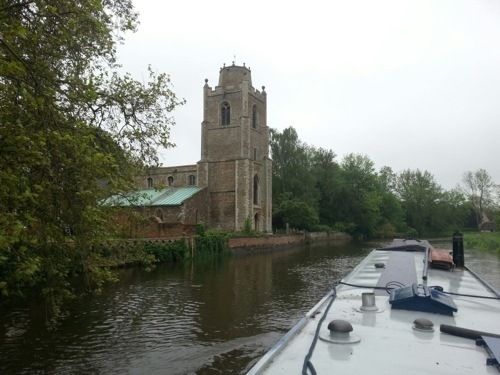 On Sunday we headed out to the GOBA moorings near Waterbeach, for a little gathering to celebrate Jackie Pippin’s birthday. 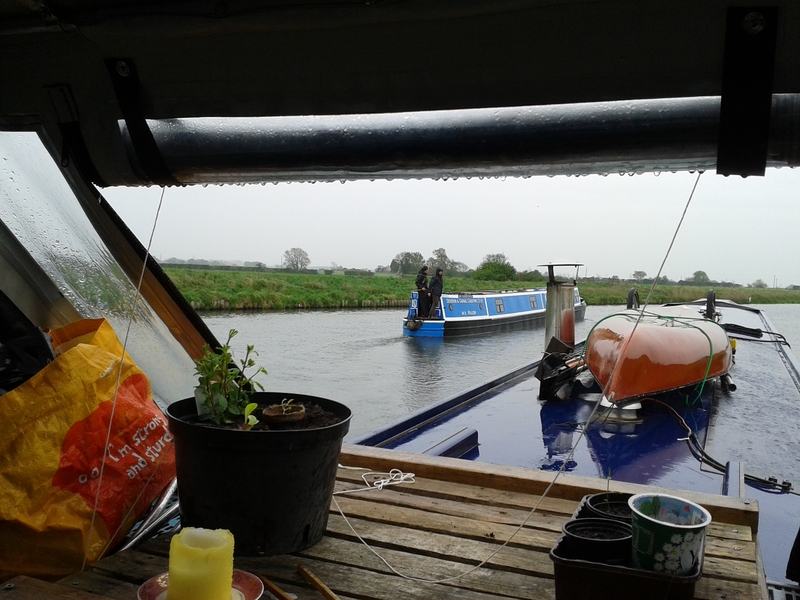 It was our first ‘pleasure cruise’ on Willow – all movements so far have been because we needed to be somewhere. So it was really nice to get out of town just for the fun of it. There were lots of rowers about as there was a race about to begin but we made it past without incident. It was also Lyra’s first proper cruise on Willow. We were interested to see how differently she reacted. 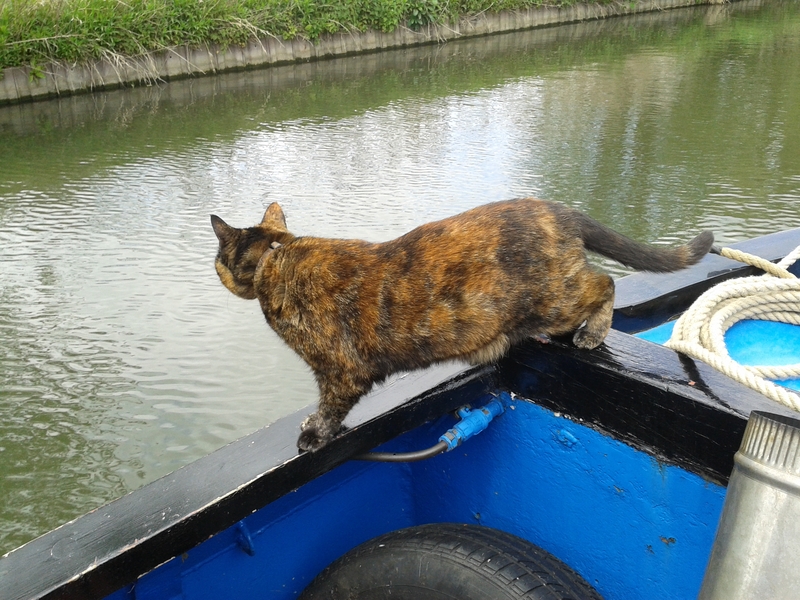 At the front of the boat it is so quiet and there’s hardly any vibration, so she seemed quite relaxed. I took her outside and on seeing the water all around she was more nervous. We arrived at the GOBAs and moored alongside Light Enough To Travel. 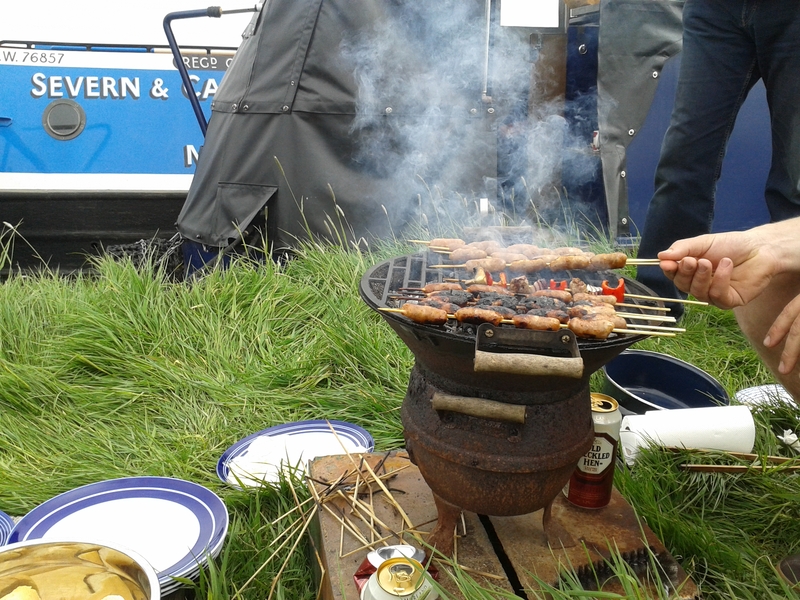 The BBQ was already lit and soon we were tucking into some delicious kebabs, sausages, bread and melted brie, fresh local asparagus, all washed down with Pimms and mojitos. Yum! 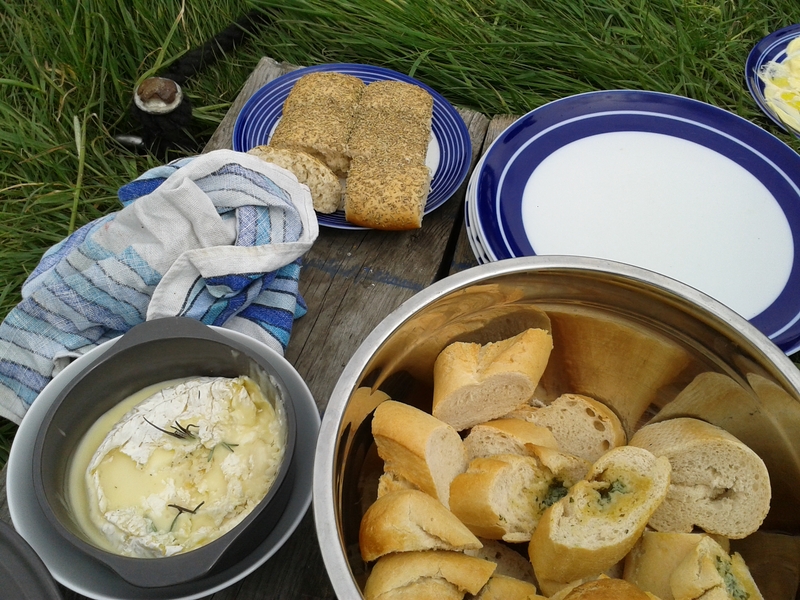 After a while sitting outside, the clouds drew in and it began to rain, but Pippin was spacious enough to carry on the celebrations inside. Later on, we decided to head back into town. Chris from Light Enough wanted to have a go steering Willow, so James and Chris took Willow, while Simone and I took Light Enough. I definitely got the best deal here – it was still raining, but Light Enough has a pram hood at the stern, so we stayed quite dry all the way into town! 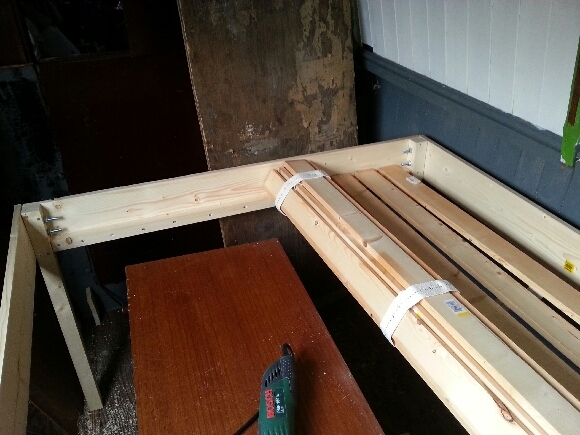 Whilst I was away at the HNBC committee meeting on Saturday, James set to work making our bed frame: one step closer to moving in to our bedroom. It’s high enough to allow the chest of drawers to fit underneath as well as other storage, but not as high as the one we had on the Duck. It can’t be finished until we have painted the bedroom though, and we still have not received the paint we ordered.